I firmly believe that God hand picks certain individuals to whom He reveals certain aspects of His heart. Parents, in general, are some of those individuals. Once you become a parent, you most definitely understand a little more about the ridiculously irrational unconditional love of our Heavenly Father. 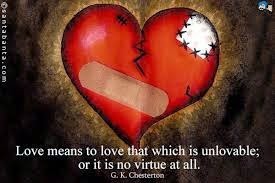 But, I also understand that there are certain people that are just simply privy to more of God's heart. Certainly He reveals Himself to all of us in different ways - but as I worshipped beside one of my dearest friends this morning, I encountered a revelation that moved me to tears. This friend and her sweet husband have said yes to one of the hardest things I think I could ever imagine. Not only have they said yes to loving other people's children as their own, but they have said yes to loving children that, if we're being quite frank, don't seem to deserve it. Knowing this precious friend, I'm certain she won't mind me sharing just a bit of what she deals with on a mostly daily basis. These children she has said yes to loving have, without a doubt, wreaked havoc in their home. Holes in the wall, broken beds, torn off blinds, pee and poop in the bathroom (not inside of the fixture in the bathroom to which it belongs), just to name a few. And then there's the spitting, the name calling, the cursing, the screaming, hissing, or growling, and the threats made. Most people would have said, "See ya!" by now. They would have picked up the phone and unashamedly pleaded, "Please, come get this child!" And to be honest, most wouldn't blame them. But...they haven't. They have stuck it out and have fought and are fighting for these kids. They aren't just fighting for the kids in a physical sense (for proper psychiatric care, medical care, education, and adoption) but they are fighting for their very souls. As I stood next to her listening to her quiet sniffles as she broke down and cried out to God as she does every day, it became apparent to me that God is revealing Himself to her in a way that I imagine very few are privileged to. The way that she loves those children despite all the chaos and discomfort and emotional stress that it causes has to be the closest earthly example I have seen to how God loves us. Oh, friend. How he loves us so. Like those precious children, we can be some of the most burdensome creatures. Our Heavenly Father loves us like crazy and He daily fights for our souls. And yet, so many of us spit in His face, we take it out on Him when things don't go our way. We curse Him and yell at Him and make it nearly impossible to love us. And yet, He does. He loves us so much He sacrificed His only Son. I believe my dear friend is getting a sneak peak into the mind and heart of our Heavenly Father as He loves and fights for us. She has such a burden on her shoulders as she tries to love these precious kids to the Father. I can't help but feel though, that what she has is one of the most blessed burdens imaginable. Love you, sweet friend. And to any other heroes out there loving traumatized children and the children that seem the most unlovable at times, thank you for fighting and loving in and through all the crazy. Your obedience does not go unnoticed. As far back as I can remember...I have loved Christmas - everything about it! Decorating the tree, taking down the yearly decor to put up the gobs of Christmas decorations, looking at light displays, singing Christmas songs, baking (lots and lots of baking), and most importantly, the entire reason we Christians even celebrate the holiday - remembering the birth of our Savior in a humble stable surrounded by animals and hay and everything you would not expect for the King. I absolutely adore this time of year. It is cliche, but I truly do enjoy the sights, the sounds, and even the smells associated with Christmas. God knew what He was doing (obviously, He's God - so duh!) when He paired me with my sweet hubby who shares my passion and adoration for all things Christmas. 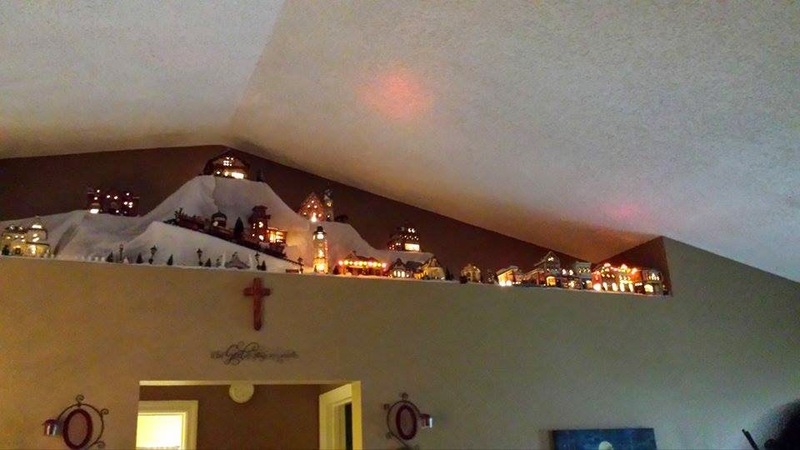 I mean, when searching for our first home to purchase, how it would be decorated for Christmas was at the forefront of our minds. The planter shelf our village sits on during Christmas was what sold our house to us in the first place. 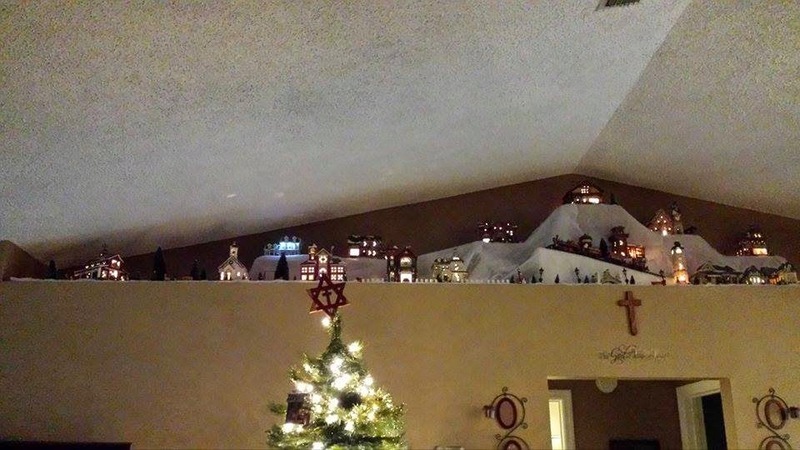 We saw it and simultaneously thought it would be perfect for our ever expanding Christmas village. Yes, we love Christmas. How we would "celebrate" Christmas never really occurred to us though until I became pregnant. All of the sudden, we had a little one to think about and we had to decide how we would do Christmas as a family. It seems to me that in recent years (and maybe it's only recent to me because now I'm an adult with responsibilities) there is a growing controversy among Christians over "how" to celebrate Christmas. Do we decorate a tree? Do we sing certain carols? And perhaps the most controversial, do we allow our kids to believe in Santa? The tree and songs has never been an issue. I've always seen the Christmas tree as a foreshadowing to the tree that our Savior would give His life upon. My favorite ornament is even a large nail that hangs near the trunk of our tree unseen by guests as a symbol of this foreshadowing. But Santa? That's been a topic of conversation since Gabriel was born. 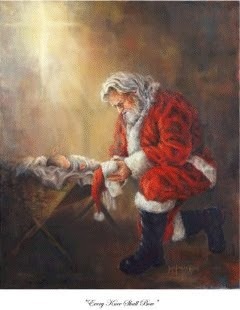 Do we as Christians allow our child to believe in a fictional character who brings gifts? I know several people that have decided for their family that the answer to that question is a resounding "No!" And that is absolutely fine. I mean it. If that is what you have decided for your family, then I applaud you and respect you wholeheartedly for your decision. However, after much discussion, thought, a little research, soul-searching, and of course, prayer...my hubby and I decided that allowing the belief of the big guy in red is okay for us - as long as we can somehow tie even him back to Jesus. I'll be honest, I struggled with this. I didn't want to "force feed" him some fictional character. I didn't want to go through elaborately thought out lengths to "convince" my sweet boy that he was real. I simply wanted to make it fun and at the same time, point it back to Jesus. My husband and I brainstormed and we talked and we researched and last year shortly after Christmas I found what I was looking for. I wish that I had thought it up on my own. I wish I could take full credit for it. But I cannot. I ran across a woman's blog who tied in Santa and even the Elf on the Shelf guy and pointed both back to Jesus. I know there are mixed emotions about the Elf. Some absolutely love the guy and go all out in their elaborate attempts to create a mischievous elf that comes alive at night to cause trouble and wreak havoc. Listen y'all, I'm just not that creative and honestly, I'm a little lazy. So I'm most likely not going to be creating "flour angels" on my kitchen counter with the elf. Not my style. But we rather enjoy the little guy. I know some of you say he's creepy and perhaps when used the way he is "supposed" to be used, then yes, that's a little creepy. But we actually don't prescribe to the whole "he's watching you" sort of thing. He's a good friend of Santa's that spends some time with our family during Christmas. He does tend to be a little naughty but it's up to Gabriel to teach him about obedience and the grace of Jesus. Gabe received a letter from Santa on Dec. 1st that accompanied Peter the Elf. In his letter, he talks about the myth of the naughty and nice list and how he gives gifts no matter what just like Jesus loves us and gave the gift of Himself despite how good or bad we are. In the letter, he talks about grace and unconditional love, and learning how to be obedient. It was a joy to see his face light up when he saw that Santa Claus had written him a letter and he thought it was so cool that Santa said he knows Jesus. So while he may find Peter in some precarious situations over the next 19 or so days, Peter is not watching Gabe to see if he behaves. It's more like the other way around. The other tradition we have started and I have already grown quite fond of is Advent. I've been interested in this tradition for quite some time. The Catholic church down the road always places a huge Advent wreath replica outside during this time and each week a new "flame" gets added to the appropriate candle. Then a few years ago when our church was in its baby stages and we met in the evening, we would visit other churches on Sunday mornings to see how they did things and what we would want to incorporate into our new church. We visited a small church called Journey one Sunday morning in December and they included the lighting of the Advent candles in their service. So it's been in the back of my mind for some time. This year I finally did the research and looked up the meaning of the Advent candles and found scriptures to read each evening. I love it. Last Sunday evening we gathered around the Advent candle holder my husband so graciously made and lit the first candle together after we prayed. I explained what the candle stood for (hope) and read some scripture. Gabe was totally into it. I don't think I realized how in tune he was until I quizzed him the second night when we went to light it again. I asked him what the candle meant and he told me, "Hope!" Then I asked him where our hope comes from and he proclaimed excitedly, "JESUS!" It was a proud mom moment. After we light the candle, I let Gabe take down the countdown/activity card from the wooden tree my talented husband also made. 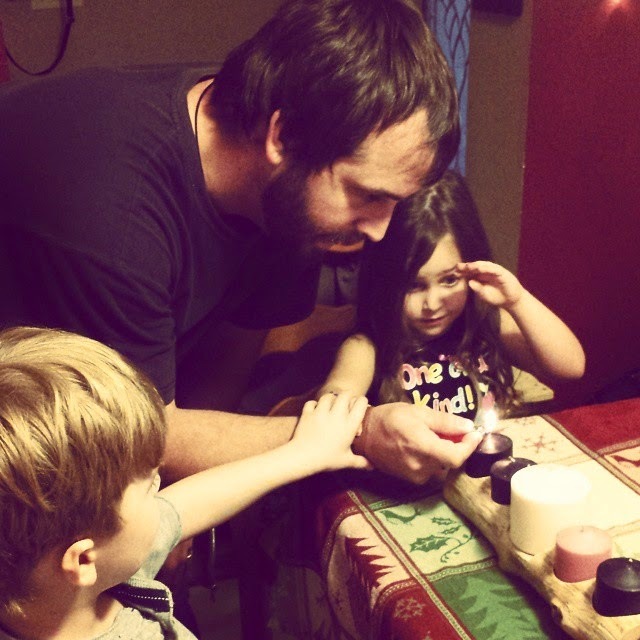 The first night we had my niece over too so they both got to make an Advent wreath craft and they both enjoyed it. The second night we welcomed Peter to our house with the letter from Santa and the following morning he was found inside one of Gabe's shoes "sledding" down his toy racer slide. 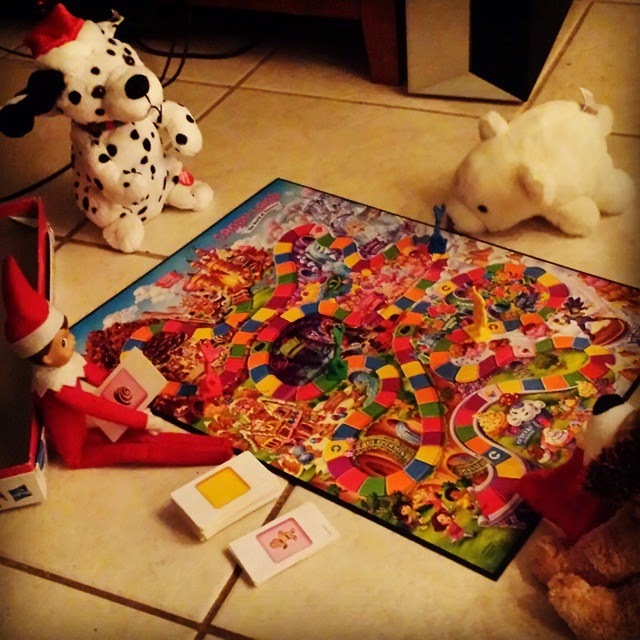 The 2nd morning Peter was playing a round of Candy Land with some other holiday creatures that normally hang out under the Christmas tree keeping the cat company (who every year thinks that the tree skirt is her new bed). The other morning, he was taking a swig of water from Gabe's favorite cup. It's simply fun! Just like he plays with his other figurines and creates little story lines for them, he does the same for Peter and I see no harm in imaginative play. With all of this said, I know several amazing parents that don't do the whole Santa and/or Elf gig and that, as stated before, is completely respectable. You do what works for your family, ya know? As for us, we're going to be keeping the jolly ol' guy around here and as Gabe grows older, we will begin the process of explaining the real story of St. Nick. And when he asks that age old question, "Mom, Dad, is Santa real?" Well, we'll tell him the honest truth - no matter what age he is. My hubby and I talked about the fond memories we have of believing in Santa Claus and we simply desire for Gabe to have those fond memories as well. But make no mistake about it - he will always knows the reason we celebrate because in everything we choose to do - Jesus will always be at the center - at this time and ALL year round.